lc blogs: the elsie awards: the winners. I tend to think of social media as my love language, so handing out awards about social media is like, my way of saying, "I really think you're very cool and your online persona speaks volumes to me." I want to be very honest about these awards: they are important and meaningful, but if you didn't win, I still think you're great, maybe just not that entertaining, you know? You not winning is NOT a personal jab at you, your Twitter feed or your lifestyle. Oh, you didn't win? Or did you? Check out the SURPRISE ELSIE AWARDS. 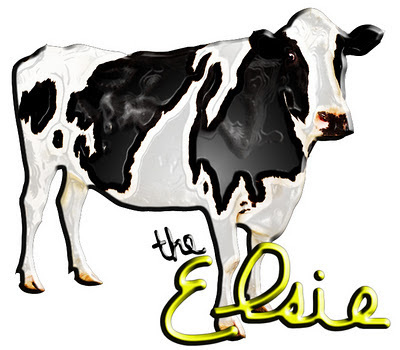 And: All Elsie awards were voted on by me and are completely and totally subjective. Some categories have a runner-up. Some don't. The most controversial category of all: The Mommy Blog. There was some stiff competition for this, but ultimately, Kerri McWilliams won out. I don't have any great reasons for this, other than: I've never read it and thought, "Yeah, riiiiiiiiiiiiiiight." Kerri's a great writer and her child is probably going to be a lot like me someday because her dad is an engineer, her mother is a creative teacher and she has a crazy aunt. Yes, this sets Olivia up nicely to be a lot like her crazy aunt's BFF. This is one of my favorite categories. I love being on the receiving end of a photo of something random or weird seen throughout someone’s day. The best photos come without any explanation, usually. 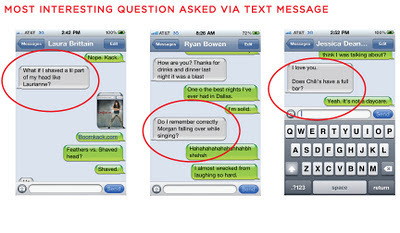 But, in the case of the winner this year, there was an explanation. Claire’s sisters put a tramp stamp on her baby. Simple, yet classic. 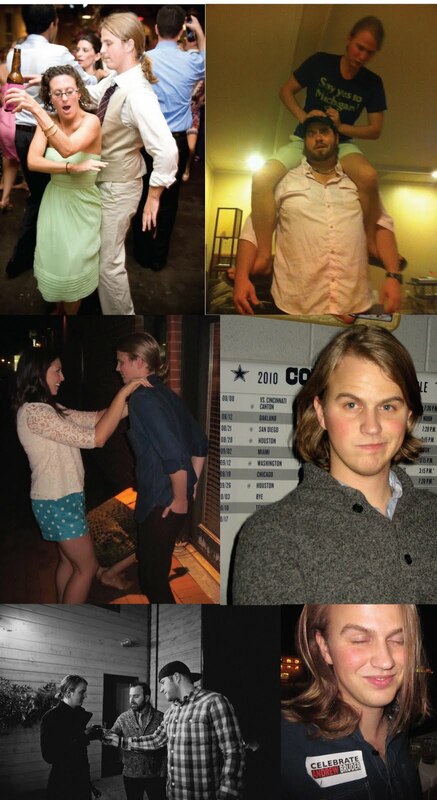 The runner-up was Mr. Matthew S. Wilson. 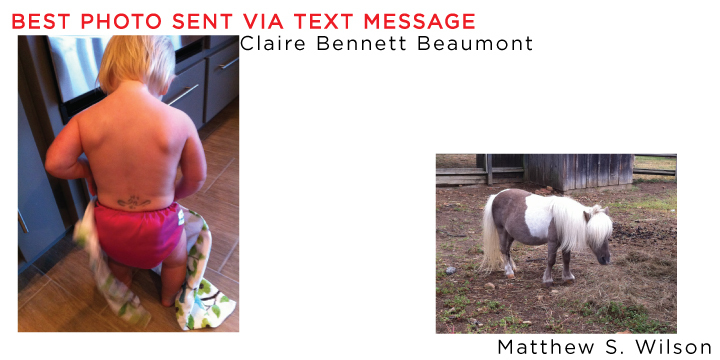 His text of a mini-horse was timely and appropriate. Why appropriate? Well, it’s always appropriate to take a photo of a mini-horse. Always. This was another fun category. 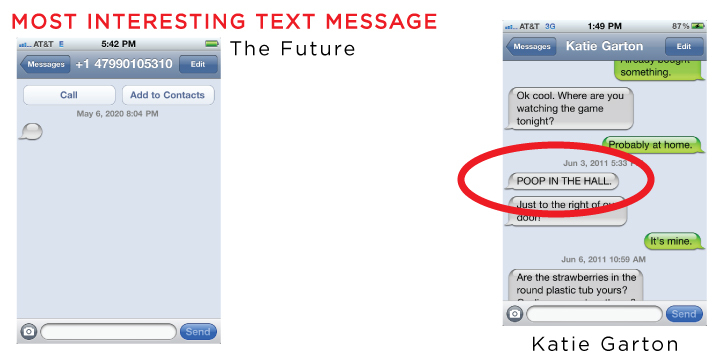 But, ultimately “The Future” took this one home. Does it really need an explanation? 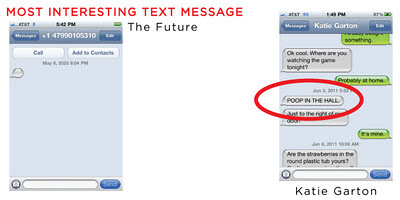 I GOT A TEXT FROM THE FUTURE. Katie Garton came in a close second. Her text was interesting, but also incredibly informative. Runners-up were Ryan Bowen and Jessica Dean Rutherford. Yes, Morgan did fall over while singing and she did get back up and keep on singing. And I mean, yeah Chili’s has a full bar. Duh. The truth in April Medina’s wall post is what put her over the top. Because, folks, somewhere a pageant baby DID just throw up. 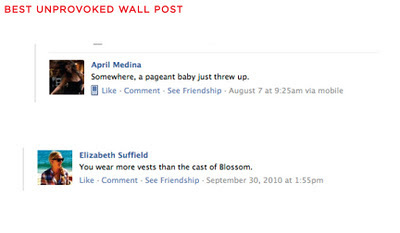 Elizabeth Suffield gets the runner-up nod because I have no idea why she wrote that on my wall. 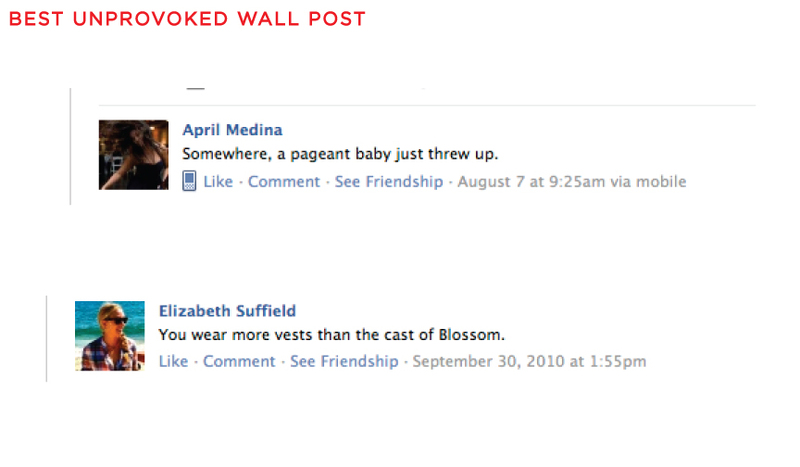 Mallory Hardin wins, but only because I don’t even know the gUrl who replied to her wall post for her. Talk about a close call. I deliberated on this category longer than any other category. I mean, look at these photos. Obviously, Ashley Festa Ariail took it home for posting this photo of Andrew G. Bruder at her wedding. This photo is too good to be true and made a few people happier than they’ve probably ever been. Gina, Evan and Oswalt were right there, too. Gina’s photo is of a couple fighting outside of her apartment door. Evan posted his photo with the caption, “’R’ doesn’t mean ‘radio.’” And well, look at that dog. Doesn’t really look like she wants to be celebrating a new year, does it? There's a major type on this photo. I'm too lazy to fix it. Apologies. Another close call because I’m vain and anybody who has ever mentioned me on Twitter was nominated. For multiple reasons, this category is a tie! The first in the history of the Elsie Awards. 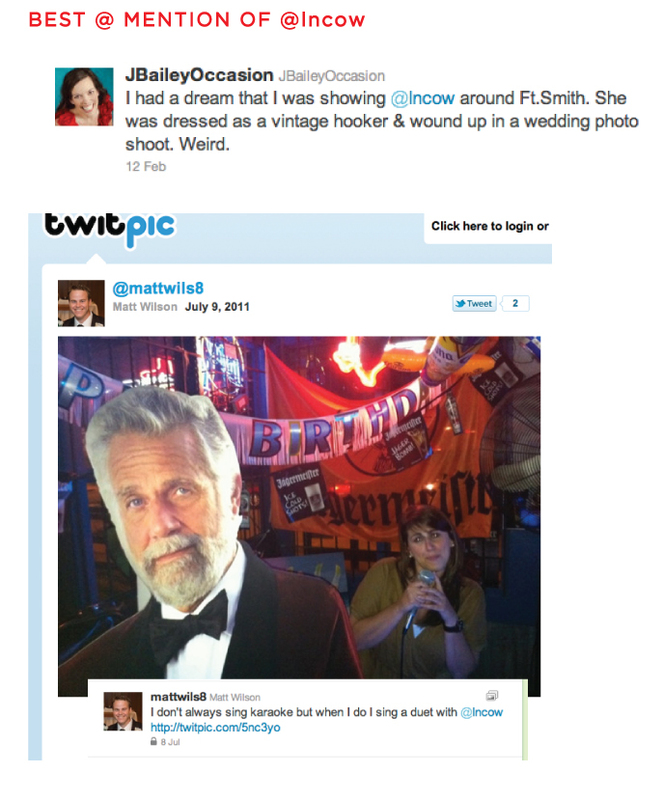 Mr. Matthew S. Wilson gets the other half of the prize because this might be my favorite thing he’s ever tweeted. We love to karaoke and when we karaoke, we love to tweet about it. I don’t like my karaoke performances to get stale, so I brought in the Most Interesting Man in the World to sing with me on a song. Matt took a photo, tweeted and he wins because of it. Brilliant! The hands down winner of this category was Morgan Stallings. The best part about her reply was that, the tweet wasn’t originally to her and then, she drug me into it because she knew I’d pee on myself thinking about it. 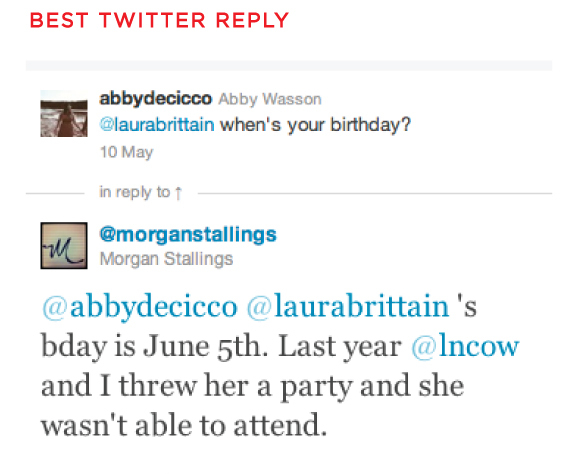 @abbydecicco was @laurabrittain’s roommate once upon a time. @laurabrittain doesn’t respond to text messages, so @abbydecicco went to Twitter to get some answers. 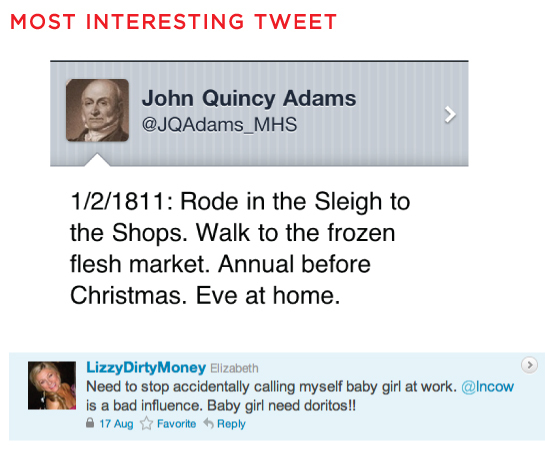 @morganstallings chimed in and the rest is Elsie history. John Quincy Adams ran away with this one! I’ve been analyzing this tweet for months and I still cannot figure out what it means. A frozen flesh market?! Is that a dating service? Second place goes to Elizabeth Garton. She shows no shame. I didn’t mean for this category to refer to citing things that I say, but it kind of ended up that way. Overall, Andrew G. Bruder does this best. He knows exactly what should and shouldn’t be tweeted and he does it so fast and usually under the table so that no one sees him doing it. April Medina comes in a close second, but she doesn’t tweet enough to knock Bruder off. This one caused some drama in my head, but ultimately James Gardner took it home because he used the “Classic RT” option and added in his thoughts versus the new RT option. 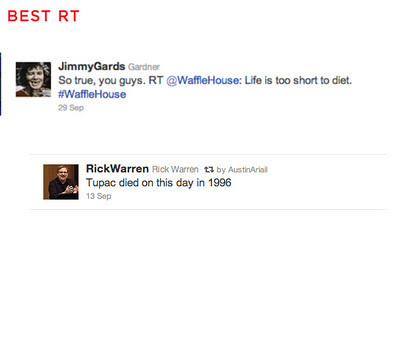 Who follows the Waffle House on Twitter anyway? Austin’s RT was so, so classic though. Why is Rick Warren tweeting about Tupac? 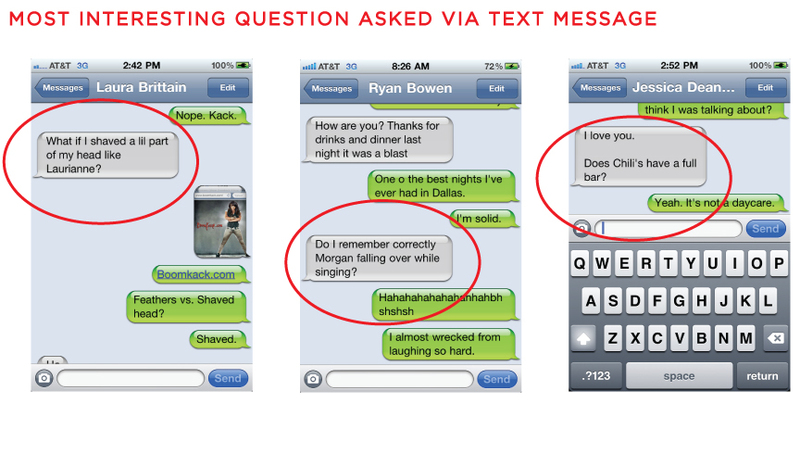 I don’t know, but I’m glad Austin let me know that he was. A battle to the very end with this one. Each of these people provide me with relevant and interesting things to look at/watch on the internetS. I narrowed it down to Jon Wasson and Natalie Jagers for the amount of links that they post. Choosing between the two was difficult. Jon’s links provoke thought, more often than not, but also confusion and sometimes anger. I do not count the anger against him because that’s a heart issue, not an internetS issue. Natalie’s links are usually a little more light, airy and funny. But, sometimes they are super artsy, out of my league and over my head. I do not count this against her because I need to be more interested in design and curtain details, right? Someday I might want to hang curtains somewhere. Natalie wins because one time, she posted a link to, “What My Little Pony Personality Are You?” Sealed the deal for me. You’ll recall in the official Elsie Award rules that: I make the rules. I choose the winners. #realtalk takes this category home. Though, “#lovewins,” “#nuance” and “#thecharliedunn” are interjected into my conversations often, none of them provide the clarity or the gravity that #realtalk does. I’ve even found myself saying, “real talk” in the middle of conversations so people know I’m not just telling jokes. #lovewins probably comes in a close second, only because #wassonwedding was only introduced about a week before the actual Wasson wedding and did finally trend itself out a few days following the event. However, in my heart, #womensfinalfour blew every other hash tag out of the water. Let’s review the rules one more time: I make the rules. I whole-heartedly participated in each of the three nominated evenings. The Jim Lee Experience was a random evening out amongst four friends who thought they were going to an early dinner and then home. 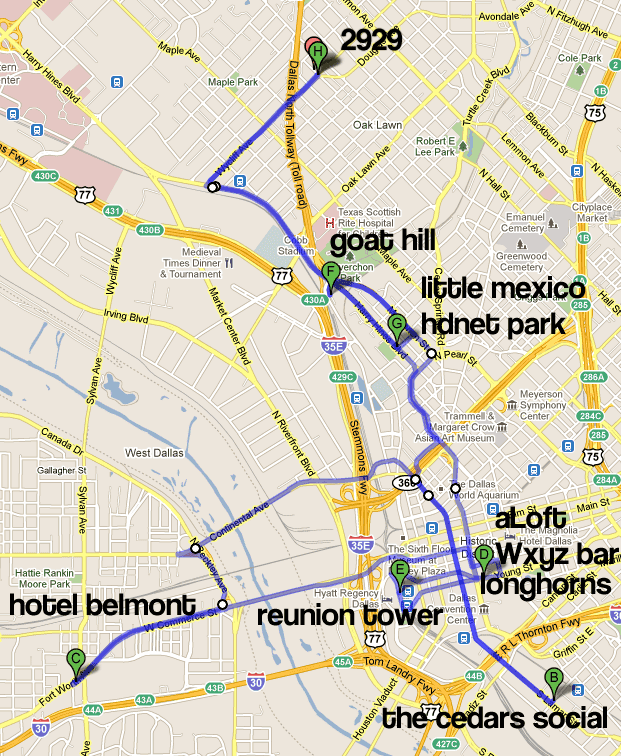 It turned into an evening of going to every place in Dallas I had ever wanted to go to. Look at that map. That’s a lot of places. We tweeted about the night and got a lot of replies and questions. It created a lot of jealousy and traction. It was a great, great night. 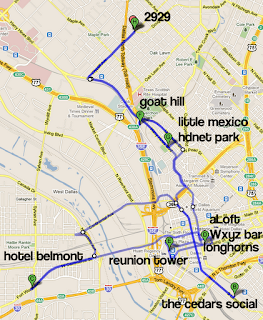 Probably one of my best ever in Dallas. But…it was not comparable to Ryan Bowen’s 27th Birthday evening on any level. Again, an evening that was supposed to be an early (like, 5:30 pm on a Thursday, early) dinner turned into a debacle involving: walking, cupcakes, acorns falling on heads, tobacco, karaoke, falling down, flat bills, work clothes, Jordin Sparks and a 1:30 am curtain call for all of us. It was one for the ages. 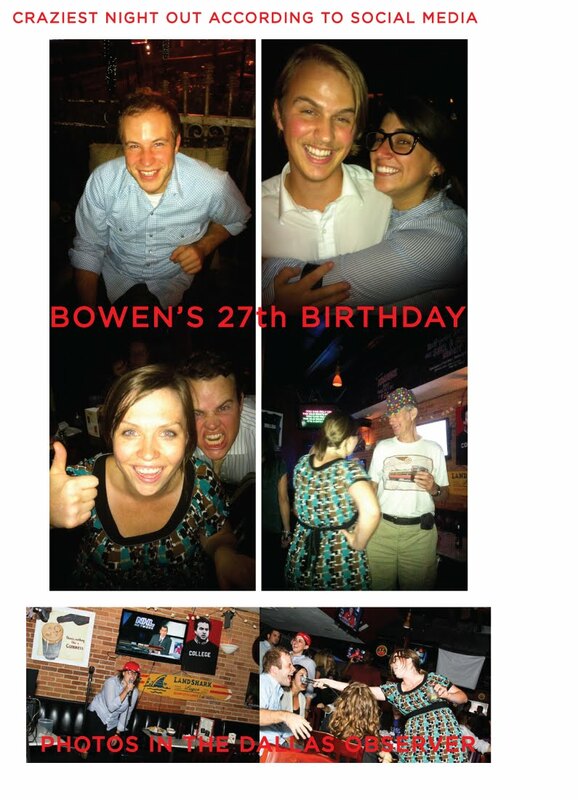 Also, the next day Morgan Stallings and me were featured in a local Dallas publication singing karaoke. Hello, paparazzi! It should be noted that the Wasson Wedding was one of the most fun weddings I have ever attended. It was sweet, beautiful, featured a great band, great food, good drinks and some of my most favorite people in the world. But, here’s the catch: it wasn’t ‘crazy.’ It was fun and respectable. And the only embarrassing thing that happened was Laura Brittain falling down while dancing. Oops. When these two were originally nominated, I thought the competition was going to be pretty stiff. Turns out, it was more like a Big 10 – SEC matchup. No contest. Andrew G. Bruder walked away the winner from the beginning, I just couldn’t see it because sometimes, Laura Brittain tweets brilliance. And sometimes, she takes photos of hilarious things. But, overall? It’s Bruder. It’s always been Bruder. Bruder is the king of internetS. Here are a few of the tagged photos of Bruder on Facebook. Gold. And check out his tweets. He uses Twitter to encourage, to humble, to share information…all the things one should use Twitter for. He doesn’t over-tweet and like I said earlier, he can tweet something someone said faster than anyone I have ever been to dinner with. 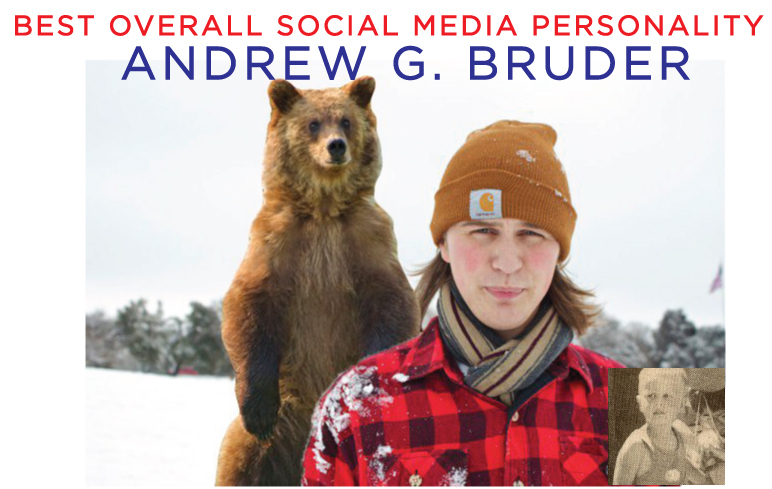 Yes, Andrew Bruder has the Best Overall Social Media Personality, but he’s that way in real life, too. Bruder is the most loyal person I’ve ever met and he’s generous. And kind. And the boy can dance. I could write a novel about the dude. These are your Elsie Award Winners. Well done...and I haven't ever met him, BUT I might have a man crush on Andrew G. Bruder now.